Apple is among the major companies reporting earnings this week. We're heading into the heart of the earnings season this week. It's a reality check on the health of the economy and where the markets stand ... and maybe where they'll go. Some of America's most recognizable brands will disclose how they're doing. Netflix (NFLX) will be the focus on Monday when it reports after the close of trading. The stock has been one of Wall Street's big momentum plays -- it was the top performing stock in the S&P 500 last year with an incredible 269% rise. But tech stocks have had a volatile ride over the past several weeks. So far this year Netflix stock is down 6%. It had a big day Thursday rising 4% as investors began to feel confident about the upcoming earnings report. RBC Capital's Mark Mahaney reportedly expects the subscriber numbers to be good. He thinks Netflix will say it has 2.25 million new U.S. subscribers and 1.6 million international subscribers. That would represent a 26% gain over a year ago. On Tuesday, look out for fast food as McDonald's (MCD) and Yum Brands (YUM) both release results. McDonald's is often a gauge for how the global economy is doing since the brand is in so many countries and its customers are average people. During the recession, McDonald's didn't suffer as much as most companies since people were still willing to eat out at a cheap place. It's expected to report first quarter earnings of $1.24 a share. That would be down from the $1.26 it reported a year ago. The Golden Arches has been fighting off competition for years, but within the last few months, it has escalated. McDonald's and Yum's Taco Bell are locked in the "great breakfast war." Taco Bell launched a nationwide breakfast menu in late March that debuted the "Waffle Taco." McDonald's responded with free coffee for two weeks. 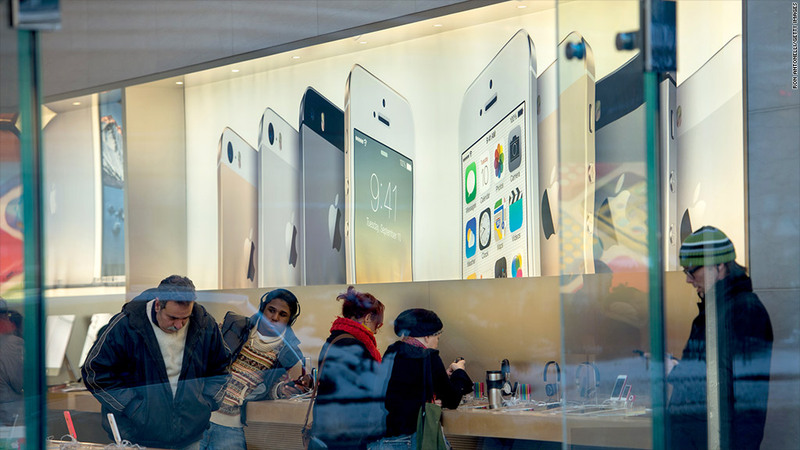 Apple's iPhones represent the company's single biggest source of revenue. The average analyst estimate of sales is 38.2 million, which would represent a 2% increase year over year. Many analysts also expect the company to report that sales of the iPad declined year over year. The iPad still represents about 20% of total product sales. As for Facebook, it has some big expectations to fill. In the fourth quarter, Facebook's revenue increased by a billion dollars from a year earlier to $2.59 billion. So far this year the stock has been up nearly 8% and that's despite a recent pummeling of those momentum stocks of which Facebook is a leading favorite. Investors will of course be watching Facebook's revenue very closely as well as any declines in North American and European users. It may be one earnings report where anything less than "spectacular" might disappoint Wall Street, much like Google last week. Thursday will be all about Amazon.com (AMZN) and Microsoft (MSFT). Investors have flocked to Microsoft as a safe haven in a turbulent market. At the same time they've been selling Amazon as part of the bloodletting we have seen in the past few weeks. Microsoft recently began selling Office for iPad, and in the first week more than 12 million people downloaded Office Apps, a very good sign for CEO Satya Nadella's new game plan for the company. But, Microsoft still has many challenges ahead, including how to transform aging business for PC operating software. Amazon CEO Jeff Bezos recently made headlines by offering employees $5,000 to quit, and has plans to shake-up other businesses, but on Thursday he'll be in the earnings spotlight to help explain how Amazon performed in the first quarter. Bezos has certainly been doing his best to boost earnings. Recently Amazon increased the price of Prime membership to $99 from $79. He also recently launched Fire TV, Amazon's answer to Apple TV and Roku. Analysts expect Amazon to report earnings or $0.23 a share versus $0.18 a share in the year ago period. Friday's earnings focus will be on Ford (F), and the expectations are high. Ford recently reported that March sales were up 3.3%, much better than expected. Leading the growth was the Fusion model, which is Ford's mid-sized sedan entry in the largest segment of the U.S. car market. Deutsche Bank reportedly upgraded Ford (F) recently and placed a $19 price target on the stock saying the new F-150 pick-up is increasingly cost competitive. Rounding things out for the week will be two important reports on housing in March: Existing Home Sales will be released on Tuesday and New Home Sales on Wednesday. Both are expected to show slight declines.